Another leaked LG Nexus 5 image. Bet you were worried we hadn't seen a Nexus 5 leak for a couple of minutes, weren't you? Thanks to a multitude of sources there's now very little we don't know about the flagship phones that Google is set to unveil on 29 September, and there's a new image to add to the pile for the cheaper model. 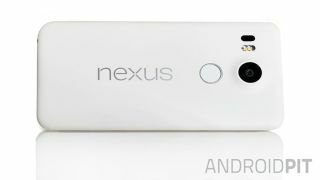 This one comes courtesy of AndroidPIT and shows the back of the LG Nexus 5 (2015 edition) in all its white glory. The picture is a genuine photo, not a tweaked press rendering, according to AndroidPIT's anonymous source. The familiar Nexus logo is present and correct, as is the fingerprint sensor we've been hearing so much about. There's also a raised camera lens (we're expecting a 13MP snapper), an auto-focus module, and an LED flash. The image lines up very nicely with other leaked pictures we've seen in the past. AndroidPIT predicts a price point of under US$400 (that's roughly £265 or AUS$580), but based on its sources the site seems to think camera performance won't be on a par with the LG G4. That would be a shame, as Google's Nexus line has often been let down by inferior camera modules - and as every self-respecting selfie-taker or Instagrammer knows, a good-quality snapper is essential in today's modern age. You can look forward to a 5.2-inch Full HD screen, a Snapdragon 808 processor, 4GB of RAM and the new-fangled USB Type-C, assuming all the rumours are true of course. In a couple of weeks, we'll know for sure.